Woking’s second Pre Season Friendly at home took place on a humid evening and in front of a decent sized crowd for a warm up game. It would be generous to call the opposition an ‘Under 23’ side; it was more of an ‘Under 19’ outfit with a few slightly more senior players involved but nonetheless Woking dealt with the opposition in a positive manner. Woking lined up in a 4-4-1-1 formation with Dowse’s team seeming to take shape now for the season ahead. This was incidentally Martin Tyler’s first outing in the Kingfield dugouts and he would surely be pleased with what he saw; the first half saw some fluid football from Woking, with a goal from a set piece and there was much to be positive about the way Woking defended in the second. Early on the technical ability of the Chelsea youngsters was plain to see and they were very comfortable passing around at the back, however the Woking players were very much willing to press and this was typified by Duane Ofori-Acheampong. When winning the ball Woking were looking to move forward via the left flank with the partnership of Josh Casey and Nicky Wheeler looking particularly fruitful. The Woking forwards were not allowing the Chelsea keeper to pass short and were out battling them in the air. The first clear chance of the game came in the 16th minute when a defensive mix up between Woking’s centre backs allowed Chelsea’s impish number 8 (McCCornick) in, to put it away. Somewhat fortunately, he was flagged offside and the game stayed level. Up to this point the centre back pairing of Jack Cook and Ian Gayle had been promising with an understanding between them about who should stop and who should cover and this was evident again following this incident. Billy Gilmour, another diminutive Chelsea player, taking up a deep lying playmaker role, was beginning to grow in influence but was unable to stop the good work coming through the Card’s left. Woking took the lead through their new number 9 in the 24th minute following a free kick from the left not far out of the box lofted in by Max Kretzschmar and won prior to this by Wheeler. Ofori-Acheampong (who was seemingly a foot taller than most of the Chelsea team) nodded in confidently after getting in front of his man at the front post. The aftermath of this saw good work again from Casey in the left back position with his assurance on the ball and tidy passing but Chelsea had a great opportunity around the 30th minute mark that should have been the equaliser; a searching cross was sent across, this time from Woking’s left and found Daishawn Redan free in the centre who volleyed against the crossbar. Woking’s best move of the game came on the 40 minute mark where a good series of movements and interchange through defence and the middle of the park allowed space for Wheeler to get a shot off, which was not near the target but was great to see in terms of the build-up play. The Cards were probably glad to hear the half time whistle as they were on the back foot towards the end but were keeping their shape and pressing effectively. A few minutes before half-time Schotterl made a fantastic saved from a deflected shot that went down to his left; he was initially wrong footed and the deflected effort from McCornick looked to be going in but a great stop prevented this. It was an engaging first half with either keeper not having much to do with some good play from both but Woking had made their greater physicality felt when it mattered. It is worth noting that Jolley had been playing in a central midfield role alongside Ferdinand, a surprise to most as he is generally thought of as a winger but he played very well in CM. Chelsea made a few changes at half time; Wakefield, McEachran and Feruz on for Lavinier, Gilmour and Brown and their captain Dabo had moved from right to left back. Woking made a number of Subs at 50’ minutes with Jake Hyde, Fabio Saraiva, Reggie Young and Paul Hodges on for Greg Luer, Jolley, Ofori-Acheampong and Kretzschmar. The starting pattern was similar to the end of the half before it with Chelsea dominating possession and it felt a goal was coming. Shortly after the Woking subs, a ball was rolled across from Woking’s left and scuffed towards goal by Feruz, beating the keeper but somehow cleared off the line. The Cards seemed a little unsteady after their changes and had lost some of their ‘steel’ from the previous half but were still keeping their shape nicely, something that has evidently been worked on studiously on the training pitch. Chelsea were winning a good number of free kicks and corners but were not making these count, they were looking to get through Woking’s midfield with through balls over the top from their defence and it is a credit to Woking’s midfield players that this was the tactic the opposition were beginning to employ. Castillo, a pacy left winger for Chelsea, was having an increasing influence on the game but the Woking players were looking to break on the counter but were missing the physical presence of Ofori-Acheampong up top to hold the ball up. Up to around the 70’ mark Chelsea were dominating possession but not really making any clear chances, the persistent harrying of Woking’s Hodges and Hyde was a notable feature and their work rate was impressive. The same could also be said of Young who ran and ran, and did a lot of good work defensively as well as offering an outlet on the right wing. Around this time Decla Appau and Kofi Halliday came on for Ferdinand and Wheeler, after Chelsea made 3 further subs. Woking were beginning to fall deeper defensively, this was recognised by the talismanic Gayle who was talking to his defence throughout. 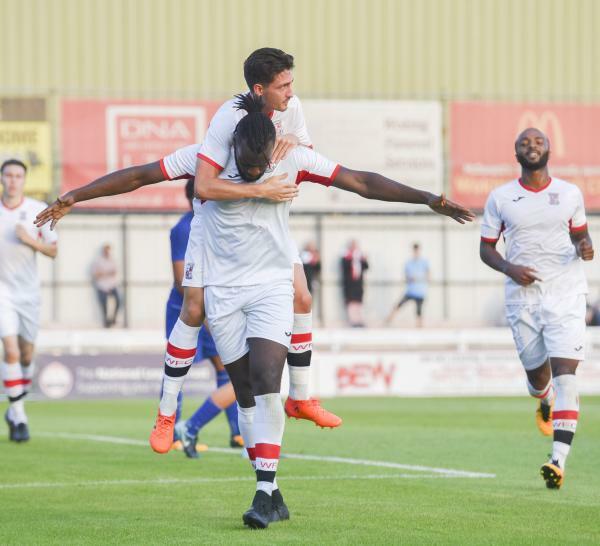 Woking had their only chance of the half in the 80th minute through Appau; the ball was thrown in from the right mid-way up the opposition’s half to Young who turned and spun confidently before shooting with his left towards the bottom left of the goal. Chelsea’s keeper had an obstructed view of this and made a late claw towards it resulting in a corner. There was another shot from Appau towards the end and Woking definitely seemed more composed in the last 15 minutes. Overall, the result was a little lucky for the Cards but this was a good performance and there were plenty of positives to take from the game. Casey, and the defence more generally looked excellent and it would be fair to assume that the team won’t be conceding too many in the season ahead! The build-up play at times was very assured and Ofori-Acheampong looks like a player who could cause a lot of problems for opponents. On a day where Dowse and his management team had run 50 laps around the pitch, they should be encouraged by the willing running of their side. It was also great to see younger Woking players coming on and not looking out of their depth against players who had come through a Premier League Academy. Dowse and his players now look ahead to the home game against Salford and Saturday and excitement builds for the season ahead. Woking: 1 Berti Schotterl, 2 Nathan Collier, 3 Josh Casey (19 Charlie Hester-Cook 83’), 4 Ian Gayle, 5 Jack Cook, 6 Kane Ferdinand (18 Declan Appau 75’), 7 Luer (15 Reggie Young 50’), 8 Christian Jolley (14 Fabio Saraiva 50’), 9 Duane Ofori-Acheampong (12 Jake Hyde 50’), 10 Max Kretzschmar (17 Paul Hodges 50’), 11 Nicky Wheeler (16 Kofi Halliday 73’). Chelsea U23’s: Karlo Ziger, Fankaty Dabo, Joseph Colley (Jack Wakely 63’), Richard Nartey (Clinton Mola 63’), Marcel Lavinier (Charlie Wakefield 45’), Billy Gilmour (George McEachran 45’), Jacob Maddox, Luke McCornick (Renedi Masampu 63’), Charlie Brown (Islam Feruz 45’), Daishawn Redan, Juan Castillo. Man of the Match: Josh Casey, stood out as defensively and creatively in the first half and was composed throughout.